oneworld member, Cathay Pacific, is offering a chance to win a trip for 2 to Hong Kong and Macau and a 5-night stay at The Venetian Macao Resort Hotel. The Special Administrative Region of Macau in China is nicknamed the ” Monte Carlo of the Orient”. 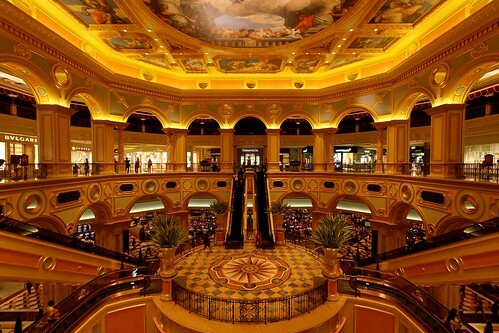 Of the more than 30 casinos in Macau, the 40-story, 10,500,000-square-foot ,Venetian is the largest. In fact, it’s the largest single building in Asia and the fifth largest building in the world. In case you’re curious, the more than 12,000,000-square-foot Terminal 3 building at Dubai International Airport is the largest in the world, and the largest in the U.S. is the 6,900,000-square-foot Palazzo hotel and casino in Las Vegas. • A romantic dinner for two (2) at Portofino restaurant. Go here for terms and conditions (apologies, but they posted the rules as a PDF rather than a webpage) and go here to enter. Good luck and have a great weekend!